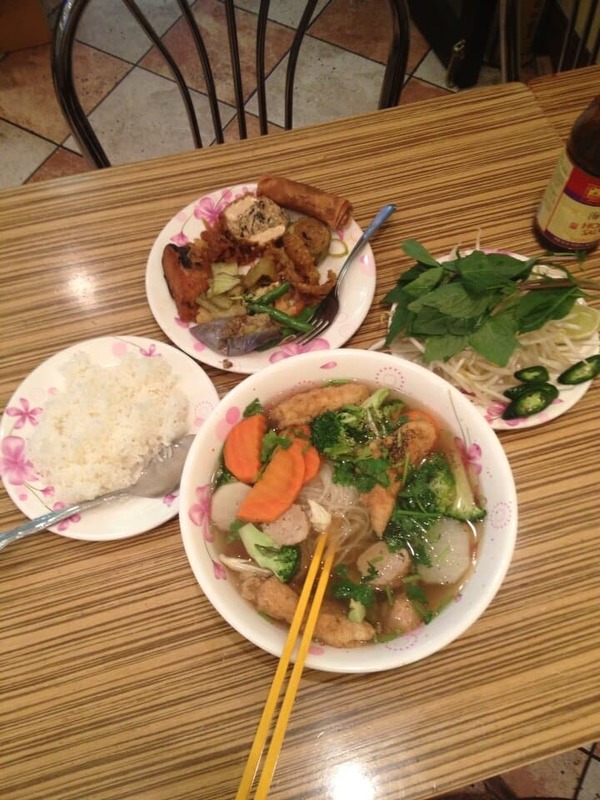 Thanh Van vegan restaurant is my lunchtime oasis | Jon Katz, P.C. Trane inspires me to keep creating and achieving. I thank Thanh Van vegan Vietnamese restaurant for being an occasional lunchtime peaceful oasis that also inspires me by the wonderful energy there, warm owners and staff, an interesting array of customers, and amazing vegan creations at this tiny place with five tables. Thanh Van is in Eden Center, 6792 Wilson Blvd., No. 37, Falls Church, Va., 22044, (703) 639-0901. Many people at Eden Center do not know where Thanh Van is, but they all know the delicious Thanh Son tofu shop. Facing Thanh Son, go left and take the first corridor on the right. Thanh Van is around four businesses down the corridor on the left. Of all the vegetarian restaurants I have experienced in my life, Thanh Van is my lifetime favorite in D.C. My other favorites are Quintessence raw vegan in Manhattan, a Chinese vegetarian gourmet restaurant in Kuala Lumpur whose name I forget, another Chinese vegetarian restaurant in Scarborough, Canada (whose name I forget), and the nondescript Indian restaurant in Singapore — using banana leaves as plates — where the man at the adjoining table thought he was complimenting me by likening me to a young Richard Nixon. Thanh Van is so authentic — rather than trying merely to mimic meat-serving Vietnamese restaurants — that I anticipate that omnivores will also love this restaurant. Thanh Van is apparently at least one or two years old. The owners speak limited English for me to ask more of their history, which also helps the peacefulness of the experience, because of the quiet we enjoy from our language dynamic. I deeply appreciate all that Thanh Van has done for me, and wish to thank them by encouraging people to visit, while the pho is hot. ADDENDUM: The D.C.-area vegetarian restaurants that I recommend are (listed by state, with vegan restaurants marked by an asterisk*): Virginia: Thanh Van*, Loving Hut*, and Saravana Palace (Indian). D.C.: NuVegan*, Sticky Fingers*, and Amsterdam Falafel. Maryland: NuVegan*, Everlasting Life* (Capitol Heights), and Sweet and Natural*. Compassion Over Killing lists more here. The Washington Post lists thirty vegetarian-friendly restaurants here.